Kickstarter - Raised $12K in 2 days! We did it! We just raised $12,000 in 2 days! Can you believe it? Never in my wildest dreams did I imagine the amount of outpour of support for ATC over these past two days. Thank you guys so much for helping to push this project forward, holy cow...we did it! I can't help but flash back to when the very first page was drawn and where I was as an artist. So much has happened in the past 5 years. I met amazing people in the comic book community, the start of the comic is when I adopted my little kitty Lui....to when I started sharing the comic at conventions. I met my fiancé at Alternative Press Expo in San Francisco! And when the campaign ends we're sending it to PRINT! AHHH! Okay, so we met the first goal. Now what? Oh boy, do you want to see it in hardcover as much as I DO???? 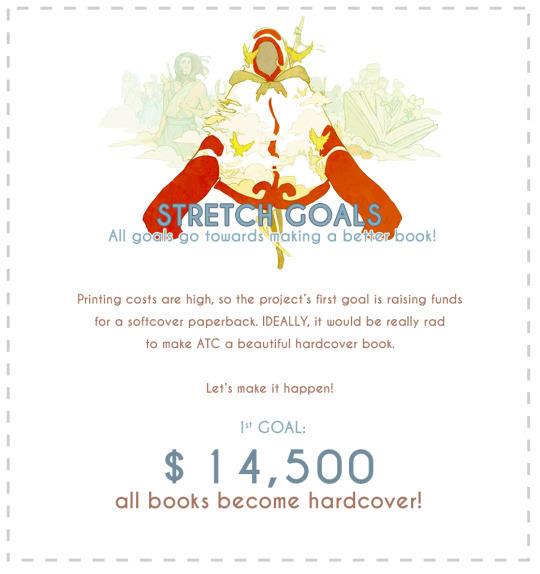 All stretch goals will be going straight to making the book even better! Wouldn't it be rad to include gold foil on the cover? Maybe have it's own BOX? I need to get busy planning out new design ideas for all the possibility of how it can be pushed further! California illustrator and comic book creator of the series Above the Clouds (atcloudscomic.com). I've worked as a cover artist for Boom! studios and Committed Comics as well an illustrator for Strange Horizons. Happiest of Birthdays! And a big Congrats on the Kickstarter!